One of my selfie outtakes from Pennsic. Since I haven't been able to work on any of my own projects in the past few weeks, I've been doing more thinking about the lessons I learned from this past Pennsic. Last week, I mentioned that my new chemise needed some revisions. 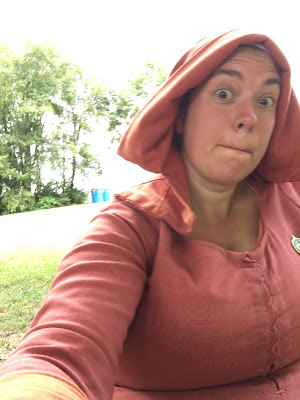 As I continued to think about that, and about what projects I wanted to take on next, I came to the realization that I had learned so much more from Pennsic then I had previously realized. I had assumed that, because of my size, the more support I could give myself, the better. When I trace this thinking back, I can see exactly where it started- the day my first supportive dress (which was not as good as what I now know is possible) failed. From that moment forward, I had this idea that I couldn't put the support of my bust in the hands of a system that could potentially fail. If you've been reading in the past few months, you know that I have gotten over my basic fear enough to switch from a modern bra to my new supportive and shaping chemise. When I evaluated the pros and cons to using a supportive chemise instead of a non-supportive one, my primary argument was that I'd rather have a backed-up plan of double support to tackle the hefty task at hand. I DO think that's valid. I DO think it was the right choice at that time, and if you are large like me, I DO think you should consider the supportive chemise as an option. I've just now realized, post-Pennsic, that the next step is further away from that than I thought it would be. My supportive chemise got a TON of wear and did not fail. On a few occasions, I wore a linen dress with no support over the chemise, and had no problems with things staying put. Meaning that the support wasn't dependent on two layers doing the job together. 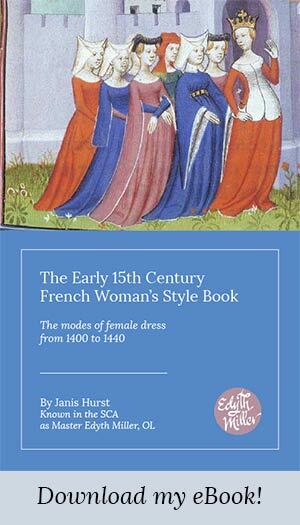 The evidence for the supportive chemise in early 15th century France is tenuous at best. So I started to wonder: what if I switched to a non-supportive chemise, and moved the supportive pattern up a layer to the cote? Would that get me to the same place? This was the exact method I shot down back in February, BTW. The chemise would still need to be somewhat trim. The style of tight-fitting chemise that Elina over at Neulakko recently did a walk-through for is what I have in mind. The limited amount of cloth is ideal, and it would help position the bust in close to the right place for the cote to then further shape and lift. By chance, I happen to have an old chemise that can do exactly that. So I put that on, and then put my blue dress on (remember that the blue dress has the same pattern as the chemise, just with 1/4" more ease.) The concept worked, with two caveats. The chemise was a bit looser than what I would do now, and the blue dress is a pull-over. For a better chance of success with this method, I would want to have a slightly tighter cote. That's easily achievable by taking out the ease and adding in a lacing. (This is in addition to the pattern adjustments I discussed last week.) I would also want to do this with a wool cote, rather than linen. Not only is that the direction I want to go, it's more documentably period. I've been looking for quite some time now for lightweight, worsted wool to do a new cote with, and I come back to this teal wool suiting time and time again. Which lead me down the color road again. Last December, I had a lot of fun trying to match the colors from the 1432 copy of Le Decameron to fabrics available online. While getting exact color matches was difficult, it was very helpful to see the range of shades that were shown in the manuscript. The difference between the range of colors found in the painted images and the dye colors that were possible at the time is a pretty big difference. When I surveyed over 500 images of women from early 15th century French manuscripts, I discovered that the range of colors was very definitively narrow. 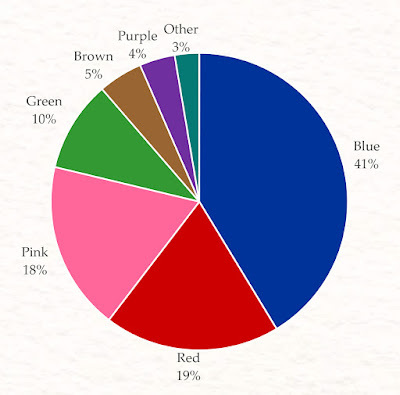 Distribution of primary dress colors found on women in French manuscripts between 1400 and 1432. That "other" category contained things like teal, maroon and yellow. In most cases, those colors occurred in single instances, which is why they still only accounted for 3% when grouped together. Most of these "other" colors also came from a single manuscript- The Maître de Luçon version of The Comedies of Terence. Those who have studied period dyeing tell us that there were many more colors technically available. This page over at Historic Enterprises shows us some examples. However, what was achievable and what was fashionable are two very different things. For instance, yellow was easily possible, but most yellows were generally avoided as a color for gowns and tunics. In order to justify using a color outside of the range in that chart above, not only would I like know if the color was possible using period dyestuff, I would also like to know if the color is documented as something that was used, and if the color makes sense for my class. This is not an easy prospect. For the wonderful teal colored wool I'd love to use, I can make a case, but it's not the best case, and the more I try to solidify that case, the more I actually weaken it. This is why sticking with the big four- blue, red, pink and green- is such a tempting idea. I spend so much time in this cycle of color decisions, it's a miracle I get anything done. Sevenstarwheel made a great point in her post about using period images as evidence- that these things hold a core truth, and to ignore it for the sake of what is pretty or exciting or unique isn't giving the period justice. Colors aside, my post-Pennsic brain is inspired. I'd like to take on more projects, and do a better job of getting solid research behind them. I've known since January the basic pieces and parts that I should be aiming for, yet I still discarded them when I created my deep blue wool cote as a pull-over piece that is too heavy to wear when the temperature goes above 80. It's the wrong type of wool for that purpose. The lining is probably gratuitous. Without lacing, it's much more fashionable than a cote, but at this point I wouldn't dream of trying to wear another dress layer under it. I love it, but when push comes to shove, it's probably more wrong than right. In the past two years, my persona has shifted slightly lower in class. Rather than being a middle class woman with counterparts such as Margret van Eyck, I find more solidarity with the working class townswoman. I routinely girdle my skirt, my collection of winged open hoods has more than justified itself, and I like dressing this way. There's practically a uniform involved in this. There is an actual list of dos and don'ts in this period, even if we can't go so far as to say that they absolutely did or did not do certain things. I'm ready to challenge myself even more to get those dos and don'ts into my wardrobe. If there's anything I've learned in my time doing medieval costuming, it's that nothing good happens overnight. I need to be patient with this process, and be open to more thoughtful experiences that allow me to see where I may have sidestepped in the past, and how I can get back on track from there. There are many things that I can see now in the choices I made with my past work that I can learn from, and build upon. Which, really, is what I've been doing all along. There's no limit to what we can learn. As an illuminator I can say with colors a lot of the time the decision to put a person in a particular dress color has other factors; how much of other colors do I have on the page? is this a background character or someone I want to draw attention to? What is the role of the character? (Is this someone to be admired and copied? a comical figure? a villain?) I don't want to put any orpiment yellow next to any of the lead based pigments because they react. Also, how much of what colors do I have mixed up? If this is a person who is going to appear in multiple pages, I want them to be distinctive too so that they are recognizable as the same person later. Same color gown, same color hose, etc. Oh, and I'd so rather use a straight color than a mixed color, which pushes to a limited pallet. Just... don't know if this is helpful or I'm just babbling now. Thought of another thing that I was going to say and forgot; when I looked at that one inventory for my Cranach dress the colors were more varied than the visual evidence. The most fashionable is over-represented in visual sources, especially portraits.. but you knew that, huh? I'm glad you started babbling, Mistress! That's actually incredibly helpful insight on the color front. I hadn't considered the difference between the ease of using straight colors versus mixed colors. I think it's pretty safe to say the blue and pink were predominant in cloth. They were both very easily produced, and would have been available to just about everyone. Red and green more limited. I guess the next question to find the answer to is if mixed dye colors held value, and if so, was that value more or less than the primary dye baths. 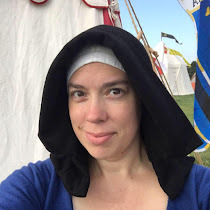 Master Edyth Miller (as she is known in the Society for Creative Anachronisms, Inc.) enjoys researching and re-creating medieval headdress, embroidery, and early 15th century costume in an attempt to expand her recreation wardrobe to be more authentic and flattering to her frame.